Mrs. Inez Ward, mother of Mrs. Hewitt. Mothers consoling wife. 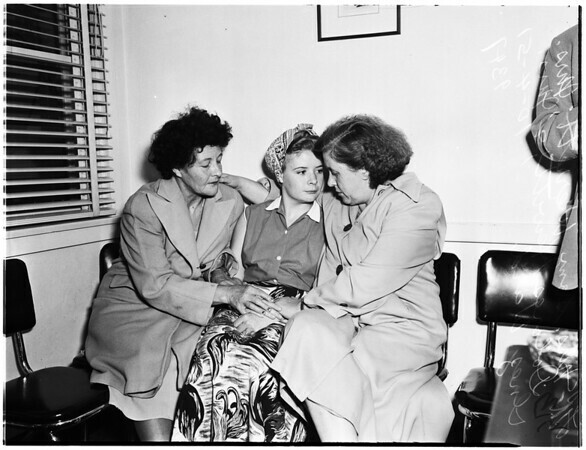 B-2: L to R: Mrs. Dolores Hewitt, and Nurse Ella Christopher beside victim after operation. B-12: Close up of victim immediately after replacing heart in chest cavity. B-11, B-3: Lt to Rt: Dr. Harry L. Fox (back to camera) working resuscitator. Dr. J. T. Small and Nurse Ella Christopher. Other people in background unidentified. B-16, B-15: Close up of Dr. Small relaxing with a smoke and talking with reporters after operation".